Without a cup of tea any meal feels incomplete to me and to any other Russian for that matter. For the longest time I thought that’s how it works all around the world. Or at least in the tea-drinking countries like Sri Lanka. One would assume that people of Sri Lanka, one of the largest producers and exporters of tea in the world, drink lots of tea. One could be absolutely correct or completely wrong depending on what the point of reference is. If the comparison is with coffee-loving Americans, then two cups of tea a day in Sri Lanka is a lot. If you compare Sri Lankan tea-drinking habits to Russian tea culture, then it’s almost like Sri Lankans haven’t even seen their own tea. Russia is one of the biggest markets for Sri Lankan tea export. Ceylon tea has always been a staple in my parents’ house, but never in my wildest dreams have I imagined that one day I would be living in the country of its origin. Even less so that Russian tea traditions will cause amusement among locals. Having a cup of tea after a meal, for example, is not a thing in Sri Lanka which I learned after having dinners with the family of my Sri Lankan husband. After the first meals together, when I was still a girlfriend, not a wife, I would come to the kitchen where his mother was cleaning up and ask: “Auntie, shall we make some tea?” “Tea? Now?” “Ummm… yes?” I replied not so sure anymore. “The dinner is over, of course, it’s time for tea. We are civilized people here!” I thought, but dared not say it out loud. How Russians and Sri Lankans drinking the same exact tea can have such different habits is beyond me. Even the word used for “tea” differs. 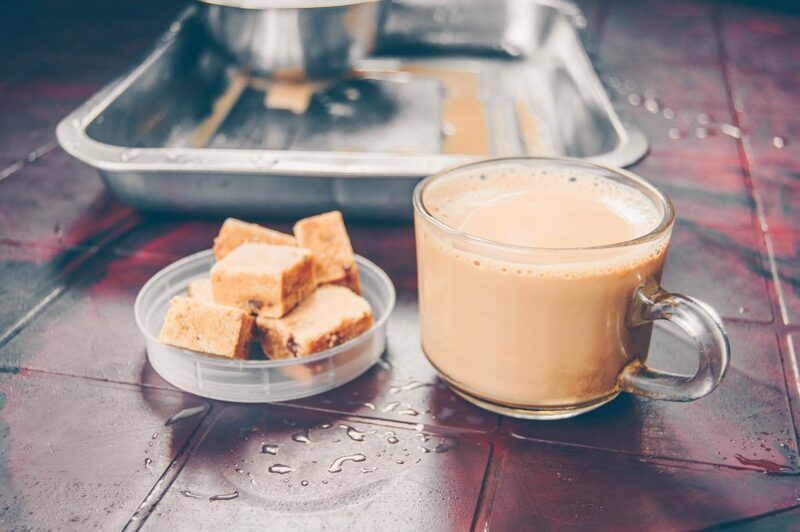 Russians call it “chai” while Sri Lankans call it “te”. Given that, with minor exceptions, there are only two words to describe tea in the whole world (variations of “te” and “chai”) I would expect us to be on the same side, but it’s not the case. When my parents came to Sri Lanka for the wedding, the outrageous amounts of tea Russians drink on a daily basis, became even more obvious. If I drink three to four cups of tea per day, my mom drinks six to eight. The first cup of tea in the morning, a cup of tea after breakfast, lunch, and dinner, a cup of tea to help tackle the tasks at work, a cup of tea after work because one needs a minute of quiet, a cup of tea because it’s cold outside, or a cup of tea because there’s nothing else to do. Any reason is reason enough to drink some tea. At my Sri Lankan house, where my parents stayed during the trip, tea was flowing like a river. I especially remember the day right before the wedding. My parents and a handful of friends, who had the time and money to travel all the way to Sri Lanka for the wedding, came over to my place. We gathered in the living room, each consumed with an important task for the next day. My friend Katya was dying my hair. Masha was translating the ceremony description into Russian so my guests had at least a vague idea why a coconut is set on fire during the wedding ceremony, or what the leaves dropped on the floor signify. My friend Anya was sitting on a bench with her feet in a bucket of cold water because after a long flight and intense heat of Colombo her feet didn’t fit into the shoes. They came over around lunch time and stayed till midnight. The whole time the kettle was on. We drank tea and ate homemade jam straight out of a jar. At the time I had a home bakery, and my storage room was stocked up with five dozens jars of mango, passion fruit, and orange jam. We went through at least four jars that night. And tea… I can’t even begin to count the number of cups we had! My future husband looked at us in astonishment and did not participate in the eight-hour-long tea-drinking marathon. Interestingly, the heat doesn’t stop Russians from drinking hot tea. In the olden days, it was common to keep a towel on one’s neck during tea-time in order to wipe off the sweat. My house wasn’t equipped with an AC unit. Nevertheless, we drank cup after cup of hot tea, sweaty, but determined to do the one thing that was familiar to all of us in this foreign land. Russian-style high tea at Headwaters restaurant in Portland, OR. They say, when tea from China first came to Russia, it was only available to aristocrats who, in their tea drinking ceremonies, were copying the British. Very quickly tea became more affordable and started going down the hierarchy ladder. Every social group tried to imitate the level above them, but due to the lack of resources had to add something of their own. Years later, tea remained, but the foreign traditions, like English ceremoniousness or Chinese precision didn’t take on. Russian dusha (soul) doesn’t recognize precision, it requires generosity, abundance, and absolute lack of instructions. Tea, for example, is never served on its own. Zephyr and pastila, cookies and candies, jam and honey always accompany a cup of tea. When there’s chai, there’s something k chayu. Chai is tea. K chayu literally means “with tea, to tea”, anything sweet will do. When you visit your Russian friends in their house, it makes sense to get something k chayu, instead of a bottle of wine. 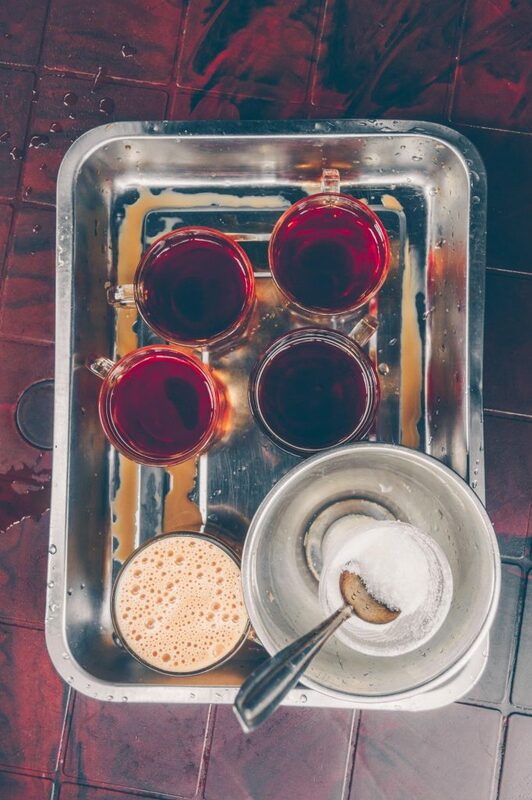 The way we drink tea dictates how we make it too. In Sri Lanka, tea drinking is quick and efficient. 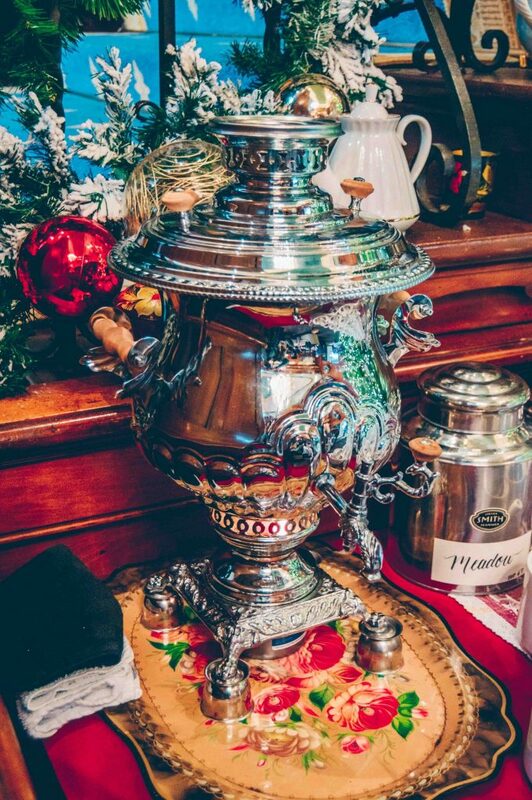 Tea leaves and hot water are combined in a large metal jug, then all of the brewed tea is poured into cups. When my parents-in-law make tea, I have to almost put my nose inside the cup to find the tea on the bottom. Just a few sips of strong brew. Drink it, wake up, get to work. In Russia, tea is meant to last long. In the middle of a conversation, no one wants to get up to brew another pot. So we make zavarka – very strongly brewed tea that is meant to be diluted with hot water. A doll in a big puffy skirt lined with thick fabric inside is set on top of the pot to keep it warm. My family has a chicken instead of a doll. Once, after a short trip to Russia, I decided to get a present for my mother-in-law and asked my granny to sew a chicken for the tea pot. Happy as I was to present my in-laws with such an original and handmade gift, they had no idea what to do with it. Sri Lankans hardly ever brew tea in teapots and never keep it warm to drink later. I guess she learned the word “chai” from years of working as a helper in Saudi Arabia and Kuwait where they say “shai”, and picked up “mama” from my conversations with mom. 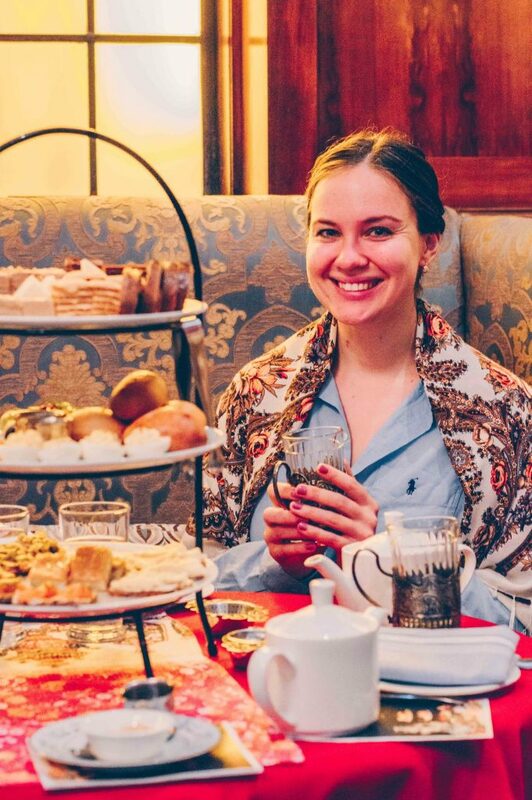 So that’s how I see Maheshari now: one woman bridging the gap between tea drinking traditions of Sri Lanka and Russia without even realizing it. P.S. If you are interested in learning more about Russian tea culture, check out this post I wrote about Russian habit of gathering in the kitchen. Thank you for the kind words, Helena! So true, a cup of tea can be a lot of different things to different people.